In anticipation of the new James Bond film, Skyfall, coming to U.S. theaters, I’ve been watching all of the previous films in the series. Last night, during the hurricane, I decided to watch The Man With The Golden Gun. Many Bond fans consider this film a low point in the franchise, but not me. While the title song was obnoxiously bad and certain moments in the movie were too campy, it was still highly entertaining. 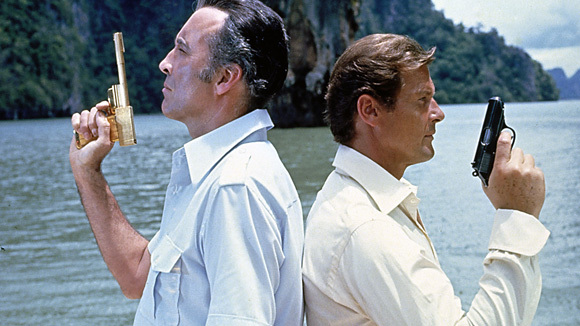 Roger Moore was both suave and physical in the film, and Christopher Lee was fantastic as the lead villain: Francisco Scaramanga. The film featured exotic locales, beautiful girls, great fight scenes, and an awesome car chase. But, for me, the most fascinating part was seeing a Bond film where, instead of being focused on taking down an entity, 007 was concentrating his efforts on the world’s best hitman – because his life depended on it. While this wasn’t the best film in the franchise, it was hardly the worst. Check out the fan-made trailer below and give it a go; I think you’ll enjoy it.